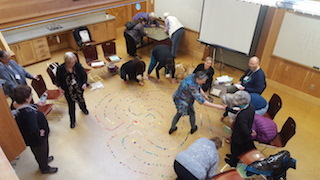 While often a source of contention among Gathering participants - too many workshops, too little time - the choice and variety of workshops this year included presentations by newcomers as well as by some of the earliest members of The Labyrinth Society. Gathering participants learned about Black Holes and White Holes with Susan Alexjander, Creating Labyrinth Settings with Richard Feather Anderson, the Legacy Labyrinth Healing Project with Christine Katzenmeyer, Strengthening Our Physical and Energy Bodies with Rūta Janulevičienė and so much more. Presenters like Emily Simpson from Sydney, Australia, shared their personal stories about the challenges they faced bringing their labyrinth dreams to fruition, or provided ways to balance the intuitive with the logical on the labyrinth like Judith Tripp with her Circle of Being meditation. Participants laughed, danced, walked, and got busy with pen, paper and other art materials throughout the three sessions on Saturday and the one on Sunday.